The NHL announced on Monday that Bruins center Patrice Bergeron was named the Second Star of the Week for the week ending March 30. Bergeron has been one of the instrumental parts to Boston's ridiculous 16-game point streak that spanned the entire month of March. Buuuut this award is just for the four games that Bergeron and the Bruins played this past week, so his month-long play doesn't factor in as much. In the four games played, Bergeron scored in all four, extended his goal-scoring streak to seven games and posted six total points (5-1-6). Bergy scored the only goal for the B's in the 2-1 shootout loss to Montreal on Monday, scored twice vs Chicago in the 3-0 shutout on Thursday night, and scored in both of the weekend games versus the Capitals and Flyers, while also assisting on Carl Soderberg's goal vs the Caps on Saturday. Bergeron has been nothing short of amazing during the Bruins' 16-game point streak. His value to the Bruins is only matched by Zdeno Chara in terms of players Boston could simply not live without. Bergeron does everything right and embodies everything you want in a hockey player. But if there is one slight knock on Bergeron's game is that he does not put up the lofty point totals of other elite NHL players. However, that has more to do with Bergeron's emphasis on preventing goals over scoring them. I truly believe Bergeron takes more gratitude in back-checking and breaking up a scoring chance rather than putting the puck in the net. Bergeron puts so much into the defensive aspect of his game that his offensive numbers take a dip. But that is also the product of playing in Claude Julien's system. That is why Bergeron fits and excels, and why, say, Tyler Seguin could not. He's the ultimate team player who would do anything for his team to win. He is consistently in the discussion for the Selke Award, once being the recipient in the 2010-11 season. 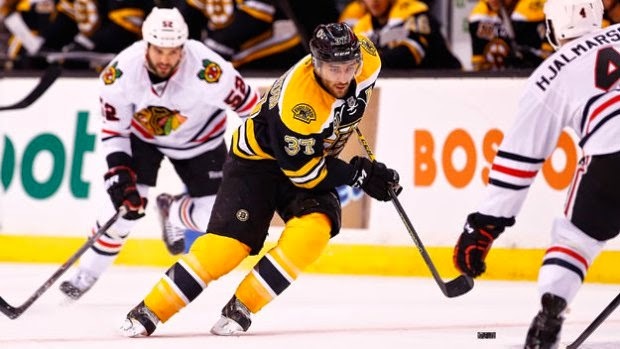 Bergeron is again one-two in the debate with Blackhawks captain Jonathan Toews this season, and according to some, is the odds on favorite to win it. But handing out the major hardware comes later in the year. For this week, Bergeron shares the Stars of the Week honors with first star Kyle Turris of the Ottawa Senators and Third Star T.J. Oshie of the St. Louis Blues. This is the third time this season a Bruin has won Star of the Week honors from the NHL, as Jarome Iginla was the recipient the other two times, winning Third Star of the Week February 9th and February 23rd.